NEGROMANCER 2.0: Dark Horse Comics Announces Second Round of Murders in "Lady Killer 2"
Dark Horse Comics Announces Second Round of Murders in "Lady Killer 2"
MILWAUKIE, OR— After its original announcement at San Diego Comic-Con 2015, Dark Horse Comics is happy to confirm the release of Lady Killer 2, the long-anticipated sequel to Joëlle Jones’s best-selling series Lady Killer. Lady Killer 2 #1 (of 5) is in stores August 3, 2016. Joëlle Jones is a comic book artist living in California. She is best known for her work on Helheim, and the follow up Brides of Helheim the supernatural Viking thriller series written by Cullen Bunn and published by Oni Press. 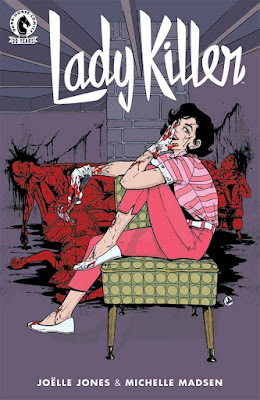 Currently she is co-writing and drawing a new original series called Lady Killer published by Dark Horse. She has worked on various projects with the New York Times, Graphic Universe, Vertigo, DC, Marvel, Dark Horse and ONI press. Michelle Madsen is a colorist whose work has appeared with Dark Horse, DC, and Image Comics. She is best known for Criminal Macabre: Cal MacDonald, Angel and Faith, X, Buffy the Vampire Slayer, Fear Agent, and The Last Christmas.